In the framework of research on clean, secure and efficient energy, hydrogen production by solar water splitting is a very promising method. Overall efficiency of a solar water splitting process is directly related to local photo-electro-chemical reactions at the photo-electrodes-electrolyte interfaces that depend on the local environment defined by its morphology, chemical composition and electronic structure. Since few years, we are interested by the hydrogen production by water splitting using oxide semiconductors as photo-anodes. Aqueous chemical growth (ACG) is used at SPEC / LNO to deposit nanostructured oxide films with thicknesses from tens to several hundreds of nm, it is more versatile and more appropriate for larger scale production. In a first step, we obtain oxy-hydroxide (FeOOH) as-grown films. In a second step, phase transition occurs by air annealing in order to obtain the useful hematite phase. 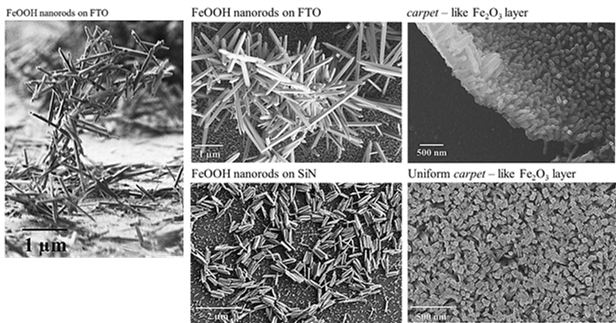 From SEM images obtained on akaganeite (FeOOH) and hematite (α-Fe2O3) films obtained by ACG we observe that the films grow as well-organized nanorods. Theirs orientations (spread out in all directions or perpendicular to the substrate similar to “carpet”- like film) is strongly dependent on deposition parameters and on substrate nature. Photo-electro-chemical activity of these films used as photoanodes was characterized on solar water splitting setup at SPEC/LNO that allows the measurement: a) of the photocurrent density as a function of the external bias applied on the electrochemical cell, b) of the transient photocurrents evidenced by ON-OFF measurements and c) of the incident-photon-to-electron conversion efficiency (IPCE) as a function of the wavelength. (See below). 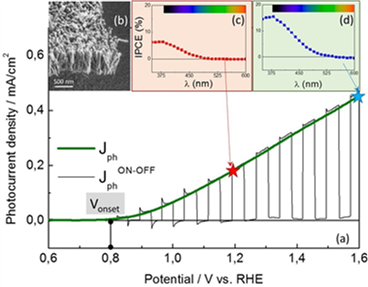 a) Photocurrent density vs. voltage for a Ti-doped hematite nanorods photoanode obtained by ACG. b) SEM image of carpet-like nanorods film. IPCE obtained at 1,2 V vs. RHE (c) and 1,6 V (d). Contact CEA : Dana Stanescu from SPEC/LNO.